In a medium saucepan, off heat, whisk together sugar and eggs yolks, a third of a cup of raspberry juice with corn flour whisked into it and salt. Add lemon juice and zest to taste, making sure not to overpower the flavour of raspberry. Place pan over medium-high heat. Cook, whisk constantly until mixture is thick enough to coat the back of a spoon, and small bubbles form around the edge of the pan, about 5 minutes. Do not boil. Add butter and mix in until it is completely combined. Add the remaining raspberry juice to curd and whisk in until you reach a desired consistency. Remember it’ll thicken as it cools. Cool with plastic wrap pressed onto the surface. Add the cream, cocoa powder, and powdered sugar, and beat with an electric mixer for 4-5 minutes, or until stiff peaks form. Roughly chop 300g chocolate using a serrated knife. Finely chop the remaining quarter (100g) or process it with the blade knife attachment of a food processor. Place the roughly chopped chocolate in a bowl. Half fill a saucepan with hot water, and put the bowl over it, making sure that the bowl does not touch the bottom of the saucepan. Slowly heat the water, ensuring it does not boil. Alternatively, use a microwave oven if you wish, but in ‘defrost’ position or at 500W maximum. Stir regularly using a flexible spatula so that the chocolate melts smoothly. Check the temperature with a thermometer. When it reaches 55°C-58°C for bittersweet/dark, or 45°C-50°C for milk or white, remove the chocolate from the bain-marie. Set aside one third of the melted chocolate in a bowl, in a warm place. Add the remaining finely chopped quarter (100g) of the chocolate into the remaining two-thirds of the melted chocolate, stirring constantly. Bittersweet/dark chocolate should reach a temperature of 28°C-29°C; milk chocolate should reach 27°C-28°C; and white or coloured chocolate should reach 26°C-27°C. Then add the melted chocolate that you have set aside to increase the temperature. Bittersweet/dark chocolate should reach a temperature of 31°C-32°C; milk chocolate should reach 29°C-30°C; and white or coloured chocolate should reach 28°C-29°C. Stir until the right temperature is reached. Make flakes by pouring chocolate onto bench and then scraping once it is firm but not fully hard. Starting with a pavlova, layer the pavlova, raspberry curd and chocolate cream. 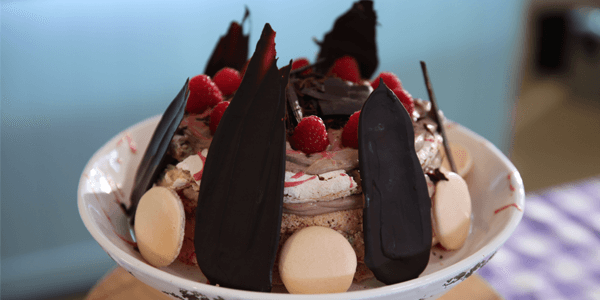 Decorate with tempered chocolate flakes and raspberries.